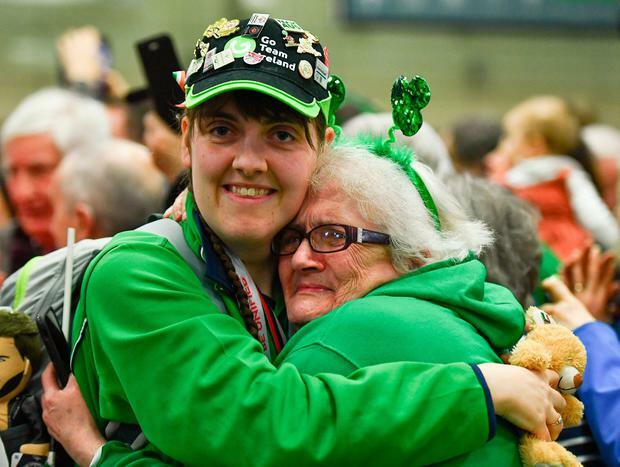 Ireland's Special Olympics team got the welcome home their trojan efforts deserved as they touched down at Dublin Airport. Friends and family packed into the arrivals hall in their hundreds, singing a chorus of 'The Fields of Athenry' as they waited for the 91 athletes to appear, draped in some 85 medals. Among those waiting was Sports Minister Shane Ross and Irish soccer legend Niall Quinn, who had been on hand before the games in Abu Dhabi to run a soccer clinic for the footballers who went on to secure bronze. "I got to speak to them before they left and I was taken aback by their positive attitude and commitment and then to bring home a bronze in the toughest one of them all, football, I am very proud of them," Quinn told the Irish Independent. "I told them I'd come if they won a medal - I would've come anyway but I had to come when they got the medal, and it is just great, the joy on their faces - what a great day," he added. One of Ireland's leading medal winners was Richard Currie (23), from Dungannon, Co Tyrone, who secured two golds and one silver medal for his efforts in bocce. "It was really hard going up against the big countries like America but I came out as the winner," he said. "I am the Usain Bolt of bocce - he has a big personality," he added. Stephen Murphy, who competed in basketball, placing fourth, was welcomed home from a strong contingent from Palmerstown and Lucan. He was most looking forward to tucking into a well-earned Chinese takeaway now he was back on home soil. And never mind cloud nine, Dublin golfer John Keating said he was on cloud 10 as he arrived home with a gold medal around his neck. "It hasn't fully sunk in yet. I've had amazing support, the whole family came out," he said. Multi-talented John (27) also togs out as a rugby referee and he could not wait to share his success with his club. "This is my first world games so we will see where we go, I will take it in for the moment and see where this goes," he said. "I started when I was 13 with pitch and putt in Spawell not far from me and I worked my way up to 18 holes and I play in a golf society in Templeogue." Galway girl Áine McDermott (25) had a successful spell at the games, bowling her way to a gold with her doubles partner Gemma Steele, of Derry.